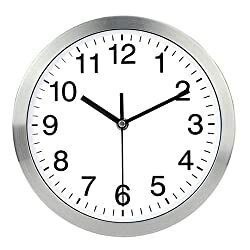 REAL ACCESSORIES® Large Silver Round Stylish Modern Wall Clock. Easy Readable Big Numbers. 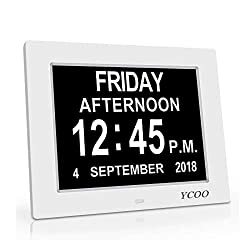 Ideal for Any Room in Home Dining Room Kitchen Office School Size : 23cm / 9"
552677 products found in Clocks. Your request for Clocks revealed a total of 6552677 results. 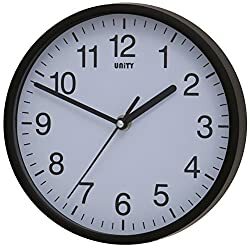 Product Features: Sweep Non-Ticking Wall Clock, 20cm / 8-Inch Diameter, Timeless Design with an Ultra Clear Dial, Requires 1 x AA Battery (not included), Precision Quartz Movement, HD DISPLAY FUNCTION: 8 " 1024*768 HD LCD, time mode [ 12 or 24 HR & AM or PM ] , date mode[ MM/DD/YY & DD/MM/YY ] , 4 time period [ MORNING & AFTERNOON & EVENING & NIGHT ] ,Auto Night Dimming, 8 languages available , Size: 8.5" wide x 6.75" high x 1" deep.